Two weeks ago, the Wicks family were stunned when fate intervened in a most unusual way. 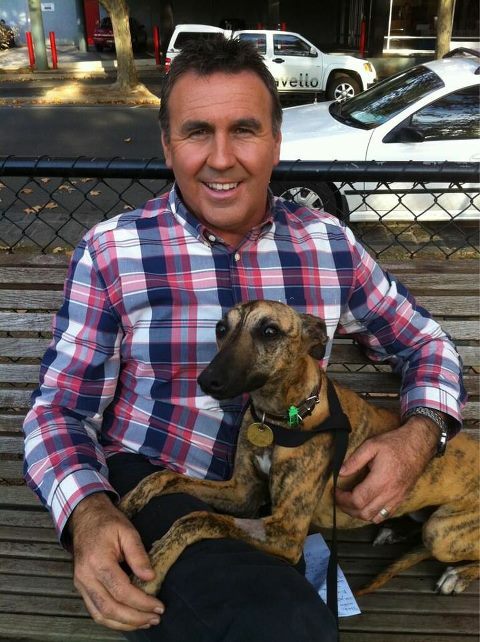 While watching Mike Larkan’s Give a Dog A Home segment on the Channel 10 News, Jo, her husband and two children could not believe their eyes when the dog featured looked uncannily like their beloved whippet, Flash, who had been missing for nine long months. “It was one of those things that, if one moment was different, it wouldn’t have ever happened. Flash disappeared leaving no trace behind during his daily run last year. Jo said the family had “pulled out all stops” to find him, contacting their council, local vet and visiting The Lost Dogs’ Home and other shelters. However, since Flash was neither microchipped, nor wearing an identification tag, the search to find him became near to impossible. Found around 35 kilometres from his home and brought to The Lost Dogs’ Home, Flash was held for the mandatory eight-day holding period before being featured on the Give A Dog A Home segment. There was plenty of interest for Flash on Facebook and enquiries following Mike Larkan’s segment. Understanding the immediacy of the situation, Jo and her family got in the car the following morning and headed to the shelter as soon as it opened. “I had made a file of all the photos we had of him since the day that we got him. We took those in with us, to be extra certain he was our dog. Now, a fortnight on, the Wicks family is counting their lucky stars that their beloved whippet is now home and settling in well. Desperately trying to piece together what happened during the nine months he was missing, Jo suspects that Flash may have spent some time on his own and could have been found and cared for by someone who didn’t realise he was a beloved pet. Now having experienced firsthand the heartbreak of losing Flash and not being able to find him through identification, Jo urges all pet owners to identify their pets with a microchip and tag, and to always keep their contact details updated. Identifying your pet with a microchip and ensuring your contact details are up-to-date is the best way to secure your pet’s ticket home. Using an ID tag on their collar is also extremely advisable. National Pet Register provides an Australia-wide pet identification and recovery service. Find out how you can get a free identification tag or discounted microchip by logging on to petregister.com. Please read if you have lost or found a cat or dog.